Discount store chain based in San Bernardino, California. Had 11 stores in San Bernardino, Riverside, Redlands, and Rialto. Each store had at least a grocery section. Most had a department store and a coffee shop. The main store in San Bernardino, along with the stores in Redlands and Rialto, had very impressive standalone toy stores. The stores gave Wise Owl trading stamps, which was a brand owned by Sage's. 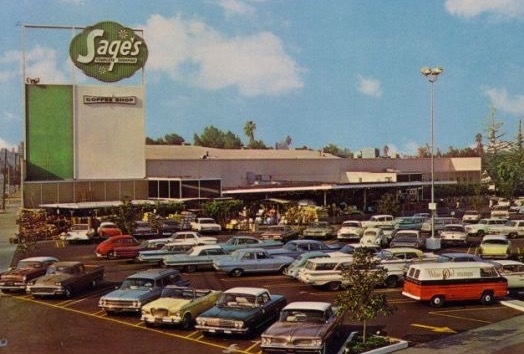 This is the store at Magnolia Center in Riverside, California, in late 1962. This building is now a party goods store. If you look around the lower right corner, there is a Wise Owl Stamp van.